Javier Fernandez became the first skater from Spain to medal at an ISU Championships when he claimed the title at the 2013 European Figure Skating Championships in Zagreb, Croatia. 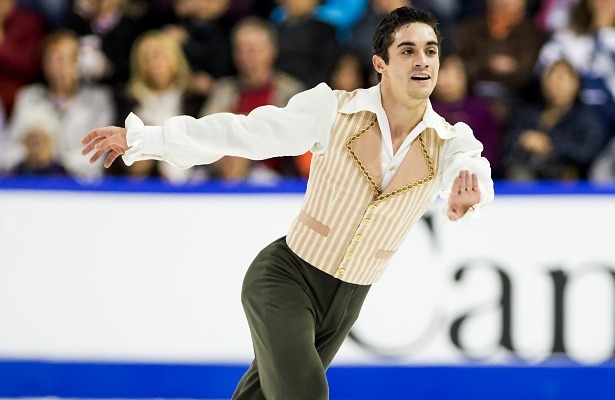 At 23 years old, Javier Fernandez has already secured his place in figure skating history as the first Spanish skater to win medals at European and World Championships, however, the two-time European Champion is still looking for more success. This season, the two-time World bronze medalist took silver Skate Canada and gold at Rostelecom Cup, qualifying for the Grand Prix Final which he had missed last year. There was a little extra pressure since the Final was held in Barcelona, Spain, in the skater’s home country. Additionally, the event was the first major figure skating competition ever to be held in Spain. Unfortunately, Fernandez crumbled under the pressure in his short program to “Black Betty”, making errors on all three jumping passes: he fell on the quad Salchow, then reduced his combination to double Lutz-triple toe and the triple Axel was wobbly. Cheered on by an enthusiastic crowd, Fernandez rebounded in the free skating to “The Barber of Seville”, landing two quads and six triples, to move up from fifth to win the silver medal. Fernandez realizes that one learns from each competition, however, this one was especially important to him as he had never competed in such a huge event in his home country. Although the two-time Olympian tried to prepare for the Final mentally, it was still different than expected and affected him in the short program. Fernandez felt great in practice prior to the short program, as well as the six minute warmup, and thought that he would do fine. There was a lot of attention from the media and the public, and the skater, supported by coach Brian Orser, tried to keep the fans and the journalists at bay. Following the Grand Prix Final, the two-time European champion stayed in Spain to spend Christmas at home and also competed in the Spanish National Championships, winning his fifth National title. He continued skating at home before returning to his training base in Toronto a few days after the New Year. The Spaniard is now preparing for his ninth appearance at the European Figure Skating Championships in Stockholm, Sweden, at end of January. As the top ranked European man in the Grand Prix Final, he is once again the favorite going in, and is aiming for a third consecutive title. He is mainly referring to Russia’s Sergei Voronov, who won the bronze medal at the Final, as well as current Russian champion Maxim Kovtun, who finished fourth. “I’m going to have a tough competition,” Fernandez pointed out. Later in March, the five-time and current Spanish national champion will also be aiming for the World podium in Shanghai, China, where he took bronze in 2013 and in 2014. At Worlds, however, Fernandez will be contending with even more tough rivals. While Tatsuki Machida of Japan has suddenly retired, Olympic Champion Yuzuru Hanyu hopes to be recovered from his health issues and there are also other strong skaters from Japan, North America and Europe. Nevertheless, Fernandez’ top competitor should be Hanyu, who usually trains with him under Orser in Toronto. While Fernandez’ skating life is more or less business as usual, his private life recently became the talk of figure skating fans when he and Japan’s two-time World Champion Miki Ando made their relationship public, announcing it in the social media networks. “We’ve been friends for a long time and we’ve been training together,” said Fernandez. Both skaters trained together under Nikolai Morozov, mostly in the USA, however Fernandez left in the spring of 2011 to move to Canada to work with Brian Orser. Ando later returned to Japan and they did not see each other for a long time. “She is a great person,” he said, adding that the relationship was made public on his initiative.